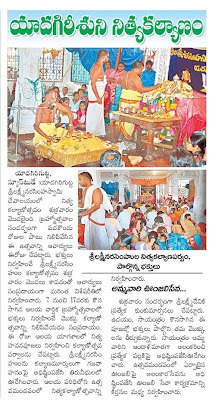 Yadagirigutta Sri Laxmi Narasimha Swamy Nitya Kalyanam re-started after 11 days in temple, which was stopped during the brahmotsav session. lots of devotees participated in the kalyanam and pray for fulfill their desires. Nitya Kalayanam tickets you can book at meeseva centers in advance or you can buy at temple office at yadagirigutta uphill on same day, devotee must be present by 9.30 AM price 1250/- INR (2 persons will be allowed, 2 laddu and 5 pulihora prasadam will be present to devotee by SLNSD). this just for your info as per my knowledge, kindly confirm with temple authorities Since some construction works going on they might be change the shedule and venue of Kalyanam. Can an unmarried person take part in nithya kalyanam? Is it only for couples? 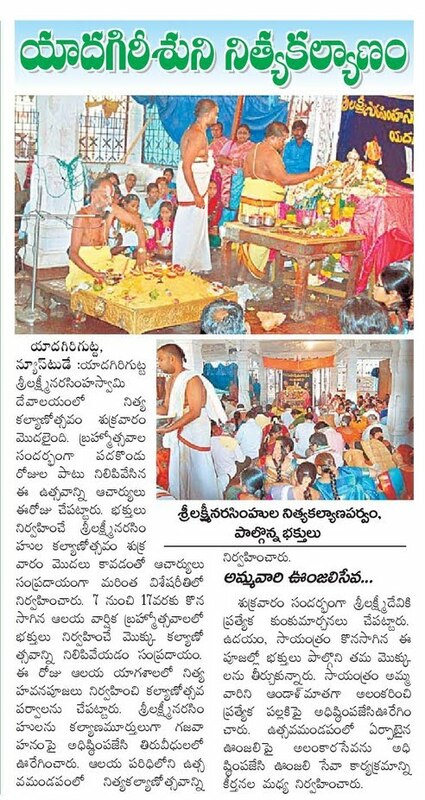 @Anonymous, as per available information, anybody can perform/participate in NityaKalyanam/Mokku Kalyanam since it is a Arjitha Seva, even a single person can also participated, but should attend in Traditional Dress code. please check with temple authorities for confirmation before booking for seva. Is there online booking for kalyanam? 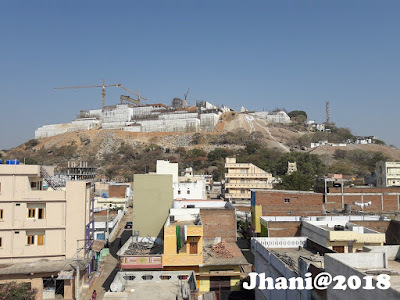 @ Unknown, as of now there is no online booking facility, since temple renovation works are going on.